Our five day infant, waddler and toddler program serves children ages 6 weeks to 23 months old from 6:30 a.m. to 5:30 p.m. A child's first years are critical for the development of the brain and language skills. The goals of our infant, waddler and toddler program is to meet your child’s individual needs while providing a developmentally age appropriate and stimulating environment. Our program provides a warm, nurturing atmosphere in which caregivers coo, cuddle, rock, hold, play, read and sing with the children. Each child will feel safe in a nurturing environment that will encourage him/her to explore, to bond with others and develop a sense of trust and security. Our curriculum provides playful, stimulating activities designed for individual children to develop their sense of trust and increase language, cognitive, physical, social and emotional development. An easy, flexible, daily schedule is very critical because it allows for relaxed routines and individualized eating and sleeping opportunities for infants and more scheduled routines as the children age. Activities are introduced as appropriate and reinforced informally throughout the day based on individual developmental growth. Music and reading are essential parts of the curriculum, and for waddlers and toddlers, sensory activities with water/sand and art enrich their curriculum.. Outdoor play is included for all ages. To view the infant daily schedule click here. Our twos program serves children ages 24 to 35 months daily from 6:30 a.m. to 5:30 p.m.. The curriculum provides a caring atmosphere including daily routines and stimulating activities that provides two year olds with a sense of safety and security. The children learn through play, teacher assisted activities, and a lot of repetition. Teachers provide opportunities for development of small and large motor skills and organize play activities to build concepts, listening skills, and develop social and emotional skills. Our staff read often to the children to develop receptive language skills, build imagination, lay a foundation for literacy and increase vocabulary. The children also participate in songs, fingerplays and rhymes that build phonetic awareness. Outdoor play is a part of every day, weather permitting, and children are able to explore and participate in more active play while improving on gross motor skills. Each day, teachers plan activities for the children to explore in the learning centers: art, blocks, science, music, reading, sand/water and dramatic play. The goal is to develop each child's sense of security and encourage and promote social and cognitive development. To view the Two's daily schedule click here. Our threes/fours program provides care to children ages 3 to 4 years old daily from 6:30 a.m. to 5:30 p.m. Appropriate activities such as language arts, social studies, math and science provides a balance of activities that expand the child’s intellectual, social and emotional development. 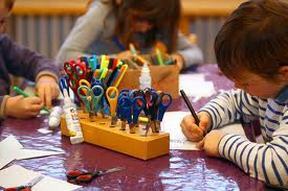 Weekly activities are planned around themes of study that are interesting and meaningful to the children. A balanced schedule provides experiences in group and individual settings. Stories, music, language experiences, projects and discussion of themes take place in groups. Individually, children choose learning center activities in which they can work and play in pairs, in small groups or alone. Each day, teachers plan guided activities for the children to learn throughout the learning centers: art, blocks, music/movement, language, sand/water, science/math, manipulative and dramatic play. Children learn to cooperate as a group by participating in circle time, rhythm & music, large and small motor skills and story time and learn to play cooperatively with one or two others during center time. Duplicates of durable materials are properly displayed in low, open shelves to encourage and promote independence and self-help skills. Outdoor play is offered everyday, weather permitting, where children are able to participate in activities to increase large motor skills. To view the 3's and 4's daily schedule click here. Ask us about our Early Head Start program! Visit http://ccri.wpengine.com/early-head-start/ for more information and to apply online. We have a five day Pre-k program for children ages 4 to 5 years old that operates daily from 6:30 a.m. to 5:30 p.m. We also offer the NC PRE-K program (a state-funded pre-k program offered through the Burke County Public Schools) which operates from 8:00 a.m. to 2:30 p.m. and follows the public school calendar. To be eligible for enrollment in either of our Pre-k programs, a child must be 4 years old by August 31 of the upcoming school year. Our Pre-K Programs are designed to provide a child-centered, literacy-focused curriculum to ensure that all children enter school ready to learn. We use the Creative Curriculum which balances teacher-planned and child-initiated activities, emphasizing responsiveness to children's strengths, interests, needs and learning skills. Teachers provide a balance of structure and self-direction, so children’s developmental skills and self-esteem are enhanced. Children's independence is encouraged and successful experiences are acknowledged. The classroom arrangement is well organized, and stocked learning areas sets the framework for the curriculum, where learning through play is the focal point. The daily schedule allows for an appropriate balance of active and quiet, large and small group, child-initiated and teacher-facilitated activities. Other core learning activities areas such as blocks, housekeeping, dramatic play, science, foreign language, art, music and movement and sand/water play are integrated throughout the day to provide engaging, meaningful experiences. Outdoor play is offered everyday, weather permitting, to allow children the opportunity to explore in the outdoor environment, build social skills and enhance large motor skills. Flexible After School Care hours (Wrap Care) are available for the children enrolled in the NC Pre-K program. If a parent chooses the Wrap Care option, children may be dropped off prior to 8:00 am and stay after 2:30 pm, with an additional cost. To view a Pre-k daily schedule click here. Our school age program provides a safe and nurturing environment for every student through positive, structured, adult supervision. Care is provided throughout the school year during after school hours, on some holidays/teacher workdays and during the summer months to children in Kindergarten through Fifth grade. Transportation is provided after school from Forest Hill Elementary and Oak Hill Elementary Schools. Staff plan activities and provide an environment where children receive academic assistance, enrichment and recreational opportunities to improve student skills; as well as a place where self-esteem is nurtured and supported and individual differences are respected. The children are taught ways of solving conflicts and receive opportunities to learn new skills.